Re: OCO - Taurus XL launch on Feb 23, 2009.
planned to be hoisted atop Stage 0 on Feb. 16. Earth's climate and carbon cycle. Propulsion Laboratory in Pasadena, Calif.
knowledge of climate forcings and Earth's response processes." burning and deforestation, have upset Earth's carbon cycle balance. needed to characterize carbon dioxide's global distribution. global atmosphere to quantify carbon dioxide sources and sinks. a wide range of nearly simultaneous Earth observations. encapsulated into the payload fairing beginning on Feb. 7.
at the launch pad Thursday. Recent years have seen an increase in record-setting events related to climate change. For example, 2005 was the warmest year globally in more than a century, and in 2007, Arctic sea ice retreated more than in any other time in recorded history. A new NASA mission set to launch later this month will help scientists better understand the most important human-produced greenhouse gas contributing to climate change: carbon dioxide. Called the Orbiting Carbon Observatory, the satellite may help us better predict how our climate may change in the future. Scientists rely on models to forecast future impacts of carbon dioxide on Earth's climate. When the carbon dioxide concentrations used in, or predicted by, these models are not accurate, the resulting climate projections can have a large degree of uncertainty. To accurately predict atmospheric carbon dioxide concentrations in the future, we need to understand natural and human sources of carbon dioxide, as well as the natural "sinks" that remove this gas from our atmosphere. The rapid buildup of carbon dioxide from the burning of fossil fuels is a relatively well understood and predictable source. Other impacts, however, such as forestry and agricultural practices, which can act as either sources or sinks, are far harder to predict with confidence. More importantly, measurements from a global network of greenhouse gas monitoring stations indicate that more than half of the carbon dioxide emitted by human activities is currently being absorbed by the ocean and by plants on land. But the current ground-based carbon dioxide monitoring network does not have the coverage or resolution needed to identify sufficiently the natural sinks responsible for absorbing this carbon dioxide. In addition, the amount of carbon dioxide absorbed by natural sinks varies dramatically from year to year, for reasons that are largely unknown. Because the nature, location and processes controlling these natural sinks are not well understood, it is impossible to accurately predict how much carbon dioxide they might absorb in the future as the climate changes. The Orbiting Carbon Observatory aims to help resolve these and other open carbon-cycle questions. "The Orbiting Carbon Observatory will provide the initial steps in the journey of measuring carbon dioxide from space, and the discoveries will be profound-we'll gather basic information about the distribution of carbon that we wouldn't have been able to do any other way," says Graeme Stephens of Colorado State University, Fort Collins, a co-investigator on the Orbiting Carbon Observatory science team. Researchers have shown that warming, particularly from greenhouse gases including carbon dioxide, is driving Earth's climate toward "tipping points." Those are the points at which temperatures could set in motion processes that are very difficult to reverse. One potential example is the runaway disintegration of Arctic sea ice and of the West Antarctic ice sheet. In this scenario, warmer temperatures melt more ice and create more open water, which absorbs more heat. This, in turn, melts more ice, in a process that feeds upon itself. Research by James Hansen of NASA's Goddard Institute for Space Studies in New York, and colleagues suggests that to avoid dangerous tipping points, Earth's atmosphere should be limited to a carbon dioxide concentration of 450 parts per million at the most, and potentially much lower. Today, the level of carbon dioxide is about 385 parts per million, and over the last few decades that number has been rising by about two parts per million per year. But arriving at models that accurately predict how carbon dioxide levels will change in the future depends, in part, on whether researchers can collect enough data to untangle the mysteries of the carbon cycle. "As human-caused emissions change, what will happen to the carbon budget [the contribution of carbon dioxide's various sources]?" Stephens asked. "There's a gross lack of understanding as to where the re-absorbed carbon is going because it's currently impossible to make global observations to see how carbon dioxide varies on both global and regional scales." Currently, a sparse network of stations across the globe collects precise measurements of carbon dioxide near Earth's surface, but the number of stations is limited and most are located far away from power plants, automobiles and other sources of carbon dioxide. The Orbiting Carbon Observatory will complement the ground-based network by collecting thousands of times as many measurements over the sunlit side of Earth. The Atmospheric Infrared Sounder instrument on NASA's Aqua satellite now routinely provides global maps of carbon dioxide at altitudes between 5 and 13 kilometers (3 and 8 miles) high, where it is most efficient as a greenhouse gas. Orbiting Carbon Observatory measurements will complement those from the Atmospheric Infrared Sounder because they are much more sensitive to the concentration of carbon dioxide near Earth's surface, where most of it is emitted by sources or absorbed by sinks. Measurements from ground stations and the Atmospheric Infrared Sounder have already shown that the level of carbon dioxide is more varied throughout the atmosphere than was previously believed. The levels fluctuate with weather and temperature and are influenced by land plants and the ocean. It's the goal of carbon cycle models to explain and ultimately predict the response of this complex system. "It's like a domino effect," Stephens said. "The climate system is so interconnected, and the carbon dioxide system is an integral part of that system." A new generation of climate modelers already considers the interactions of carbon between land, ocean and atmosphere. These models predict that the growth rate of atmospheric carbon dioxide and of global warming will accelerate as Earth's land and ocean show a decreased capacity to absorb carbon dioxide. But with the current scant observations of the carbon system, the magnitude and timing of such model predictions are highly uncertain. The next generation of carbon-climate models will better represent these systems, thanks to more abundant global carbon dioxide data from the Orbiting Carbon Observatory and other future satellite missions. And while the data from these new satellites may not be as precise as data from ground stations, the models will nonetheless improve due to the tremendous volume of data from across the globe and throughout the atmosphere. Researchers expect the volume of carbon dioxide data to increase dramatically. "This is tremendous," says Inez Fung of the University of California, Berkeley, a co-investigator on the Orbiting Carbon Observatory science team. "There is much horizontal and vertical variation of carbon dioxide in the atmosphere due to sources and sinks and turbulent mixing processes that vary between day and night, from place to place, and from season to season. The Orbiting Carbon Observatory will give scientists a much more complete global picture of how the carbon cycle works." The observatory will measure the percentage of carbon dioxide present within columns of the atmosphere that span less than 4.1 square kilometers (1.6 square miles) on the surface and extend all the way up to the satellite 705 kilometers (438 miles) above. "This is a major advance over the traditional surface observations, which are sparse and which sample only at fixed heights and mostly near the ground," Fung said. The Orbiting Carbon Observatory information will allow researchers to "see" for the first time carbon dioxide sources and sinks. The information will allow researchers to assess, or "rank," the performance of carbon-climate models and will help to flag areas that need additional study. Researchers also expect the observatory to turn up surprises where little or no carbon dioxide data have been taken, such as over Africa, Eurasia and the open ocean. "I am extremely excited-I have been working on the carbon cycle for over 25 years and have been hampered by the data scarcity," Fung said. "Christmas is coming." 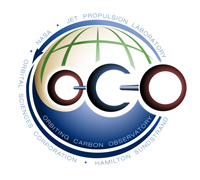 For more information on the Orbiting Carbon Observatory, see: http://www.nasa.gov/oco . Feb. 9. OCO will then go to the launch pad on Feb. 10. 3, was transported to the launch pad on Feb. 3, joining Stage 0.
vehicle integrated stack is set to be hoisted atop Stage 0 on Feb.
Taurus Flight Simulation No. 3 currently is planned for Feb. 11. Also, some images (which are a bit hilarious, admit it) of the fueling process with SCAPE suits... Arianespace's are a bit more ergonimic. This article from the satellite collision thread talks about threats to the A-train orbit, where OCO is supposed to go. Any talk of delays? FWIW as of 5 pm today (Friday the 13th!) JR and Ron Grabe are scheduled to be at VAFB on the 23rd for the launch. I was thinking about going myself, but I've had so much travel recently that I think I'll punt (I would be a tourist there, anyway - not my rocket, not my satellite). How do the instruments on this spacecraft compare with those on the recently launched Japanese GOSAT? The satellite is already built, as is the Taurus. The rocket is already being stacked, and the satellite should be buttoned up by now inside the fairing. Since the A-Train probably can't be moved significantly out of the way, and there are already 5 birds up there with 2 more almost ready to go, I'd guess that NASA would just go ahead and launch OCO (and later this year Glory) and hope for the best. Just my take on it though. Any reason for the one day slip?